When we last saw Mark Hamill in the "Star Wars" saga, he was a mysterious hooded figure on a jagged, remote island off the coast of Ireland. "For a cameo that brief, boy did they make me work," Hamill jokes. But in "The Last Jedi," which Disney will release Dec. 15, Hamill plays a much larger role. "Star Wars" will buzz again — 34 years later — with its original hero. Luke Skywalker is back. 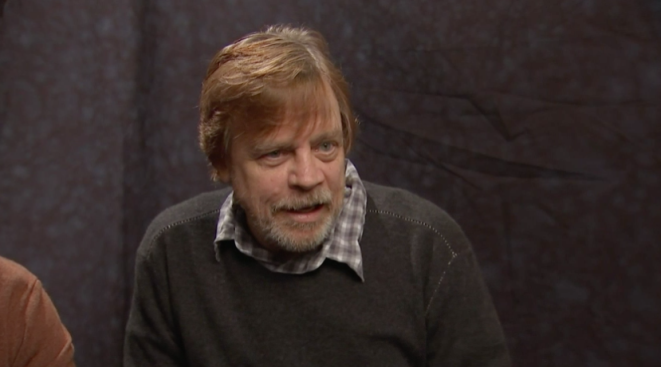 In a recent interview with The Associated Press, Hamill spoke by phone from Malibu, California. "It's just the calm before the storm," he said. "With something like this, it's almost too high-profile for comfort." Hamill, though, is a veteran. He's been living with the glare of "Star Wars" for a long time. "The movie had such an impact, you thought: Oh my gosh, I already know what the first line in my obituary is going to be," he said. "Which is odd and eeiry." Having briefly served as a copyboy at the AP's Los Angeles bureau while a college student, Hamill introduced himself as "a fellow AP employee." Jedi masters, it turns out, hail from the most unexpected corners of the universe. AP: Do you ever reflect on how much your life changed by a simple audition for a funny-sounding science-fiction adventure more than four decades ago? Hamill: The thing is, they got it down to two sets of three: a Han, a Luke and a Leia. There were three other actors, and then Carrie, Harrison and myself. And there was never a mix or a match. You go with one team or another. It's just weird. I did a TV series called "The Texas Wheelers," which I thought at the time was really groundbreaking. We got canceled so quickly, but if that had been a success, I wouldn't have been able to do "Star Wars." Fate is a funny thing. Who knew? AP: After all these years, how did it feel to be Luke again? Hamill: A thing that felt maybe wrong about coming back was the fact that the original trilogy had a beginning, a middle and an end. But there's two ways of looking at that. On the one hand, it had closure. But if you look at it another way, it's the story of how Luke went from becoming a farm boy to a Jedi and then the story ends. It would be like telling the story of how James Bond got his license to kill and became 007, and the story ends. AP: So you had some hesitation? Hamill: When they asked me to come back, it was scary. I thought, "Gee, it was hard to catch lightning in a bottle the first time. I don't know if this is such a wise idea." When we left, even if they were going to do a third trilogy, it wouldn't have anything to do with us. George (Lucas) never said you're going to do three more. He did mention maybe coming back and doing a cameo and handing Excalibur to the next young hope. This is back when we were doing the first one and I thought, "What is this supposed to be?" AP: Did this feel like a different Luke to you? It sounds as though this is a darker version of the character that may be unfamiliar to fans and even to you. Hamill: Absolutely. Luke changed, I think, more than the other characters in the original trilogy, from callow farm boy to a Jedi in training to finally a Jedi master. What you're talking about is what really fascinated me. Between "Return of the Jedi" and "Force Awakens," there's just decades of history that's unknown. So I was wondering how they're going to handle all this. Now, obviously, with "Force Awakens," J.J. (Abrams) had a full plate. It was inevitable that they would push me down the line. I was sorry I wasn't able to work with any of the original actors again. But it's not about us anymore. In this new one, I was saying to Rian Johnson: I need to know my backstory. It was kind of unclear. You read where he is now and what he's doing now and sort of have to fill in the blanks for yourself. So I did do a backstory myself. It's not about Luke anymore, so it's not really important. But I had to make sense of it for myself. What Rian came up with, I was stunned. AP: Does it feel different to be putting out a "Star Wars" movie without Carrie Fisher, who died in December, and Harrison Ford, who exited with "Force Awakens"? Hamill: It is different. She was irreplaceable. There can never be a proper reunion anymore. It's tragic. I hate that it adds an air of melancholy to the film because it doesn't deserve it. I know for a fact she would obviously want us to be having fun. She was all about laughter and enjoying the moment. We're all sort of having this communal period of grief. In a way, it sort of reflects the movies themselves, which were about triumphs and tragedies. They are about a family — a dysfunctional family, but a family nonetheless.